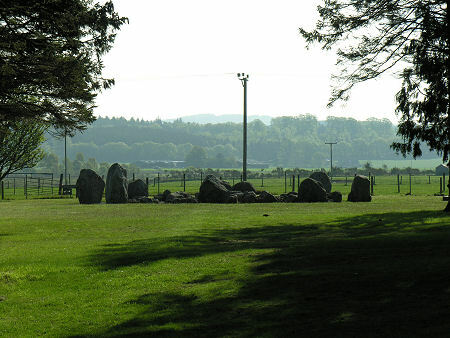 Aberdeenshire has so many stone circles that it becomes easy to overlook just what remarkable structures they are; how remarkable it is that our distant ancestors could have put quite so much effort into constructing them; and how remarkably similar they are over quite a large area. Well, most of them, anyway. Anyone arriving at Cullerlie Stone Circle is in for a surprise, because it simply doesn't fit the standard pattern found in Aberdeenshire. 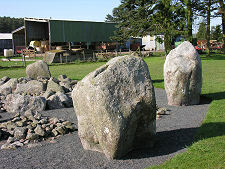 A typical stone circle in the area was built over 4,000 years ago and has as its focal point a recumbent (horizontal) stone with a pair of upright flanking stones. 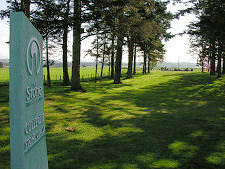 Then, typically around 3,500 years ago, its use changed from astronomical observatory to cremation cemetery, and a burial cairn developed in the (presumably) previously empty centre of the circle. What you find at Cullerlie is different. 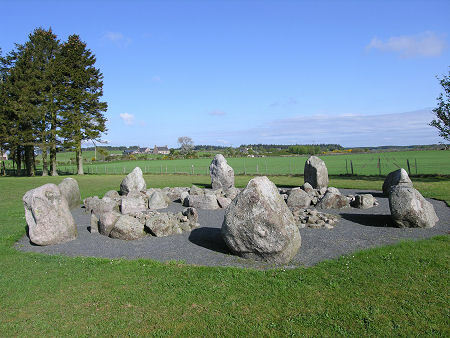 It is almost as if a group of our slightly more recent ancestors, from around 3,500 years ago, found themselves living in an area without a handy already ancient stone circle of the sort which served everyone else in Aberdeenshire as cremation burial grounds at the time. So they built one for themselves. 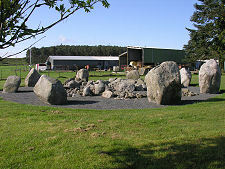 What they built comprised eight rough granite boulders set in a circle of just over 10m diameter. 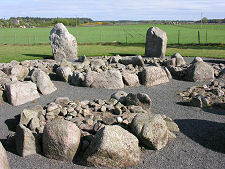 Within the circle they constructed eight cairns. 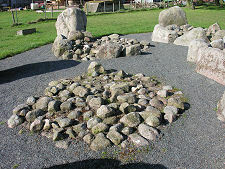 Six had kerbs comprising a single ring of eleven small stones each, while another had a kerb comprising a twin ring of stones, also eleven in total. The eighth cairn had no kerb. 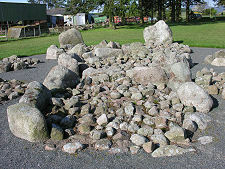 Cullerlie Stone Circle lies some three miles east of Echt and about three quarters of a mile south of the B9119 at Garlogie. It is signposted from a minor road, on which a pull-off area has been provided. You walk to the circle along an avenue of trees which dramatically frame the stones against the countryside beyond (and against an unfortunately sited electricity pylon). The circle itself is one of the most carefully manicured in the area, set within a gravel circle that shows off all the elements which were unearthed when the circle was excavated in 1934.